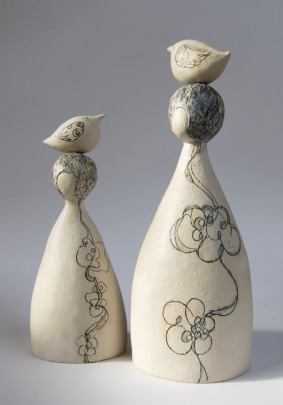 Karen creates simple, contemporary ceramic sculptures, wallhangings and tiles. Her sculpture, usually figuartive are three-dimensional forms reminiscent of a line drawing or a simple illustration. Together or alone they bestow the essence of fairytale or myth. Often androgynous, their individuality is revealed by a simple characteristic, a bird, a tree or a building. Working in both stoneware and porcelain she handbuilds using coiling and slab building techniques. 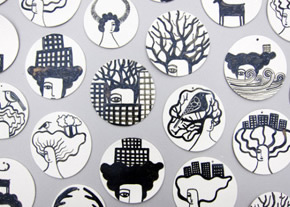 To decorate she uses porcelain slip with stains and oxides, firing in an electric kiln.